It doesn’t matter the time of year, I’m always dreaming of another trip. 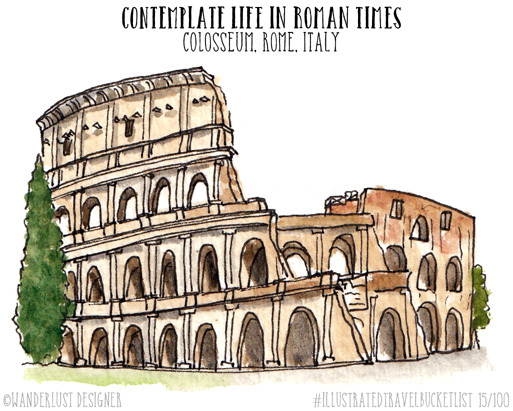 Below is a continuation of my illustrated Travel Bucket List. I’ll take you to Africa and Asia, South America and Europe– come see the next 10 incredible spots that are a must-visit in this lifetime. 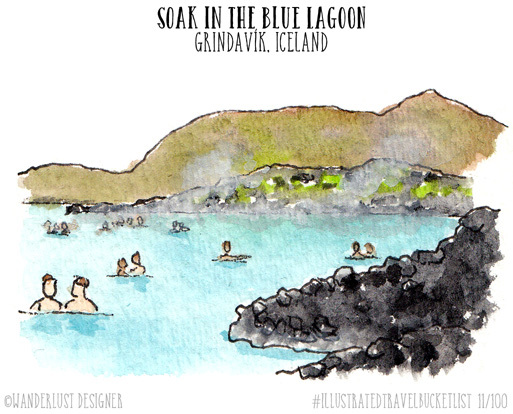 The Blue Lagoon is a geothermal spa located about 50 minutes from Reykjavik or 20 minutes from the Keflavik International Airport. Although it is a man-made lagoon, the water is fed by a nearby geothermal power plant and renewed every 2 days. The water temperature averages a balmy 99-102 degrees F year round, so even in the cold of winter, it will be soothing experience. The mineral-rich water gives the lagoon its beautiful milky blue color and is reported to have many healing qualities to help with skin ailments. Temple Bar is an area in central Dublin reported to be the cultural quarter popular with tourishts and sports a lively nightlife. 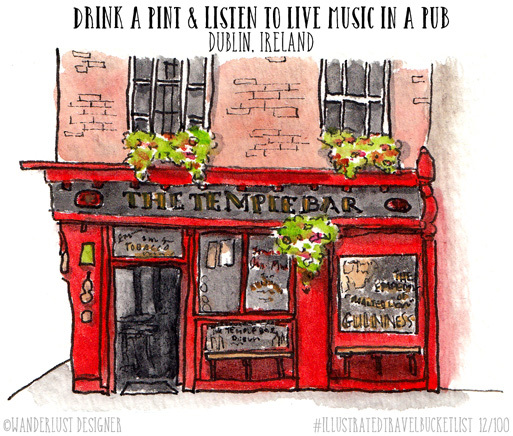 The Temple Bar Pub is just one of many pubs that offers live Irish music and a great atmosphere to soak up Dublin life. Lining a dirt road between Morondava and Belon’i Tsiribihina in Menabe region of Madagascar is a large grouping of the unique looking baobab trees. This road is called the Avenue of the Baobabs, or also the Alley of Baobabs. These Dr. Seuss-like trees are sometimes referred to as upside-down trees. They can reach up to 98′ tall and live up to 800 years. The fat circumferences can be almost 160′ around. 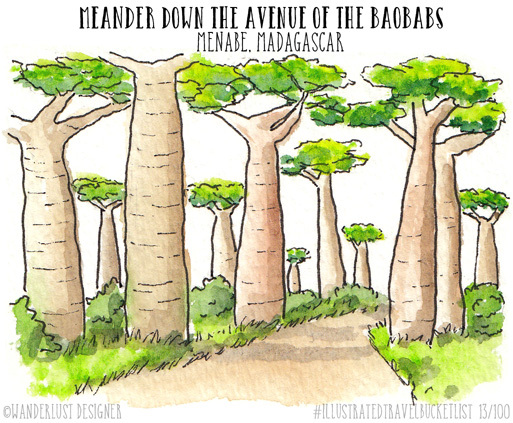 Although the baobab tree is not indigenous to Madagascar, travelers come from all over the world to see this unique Avenue, making it one of the most visited spots in the area. 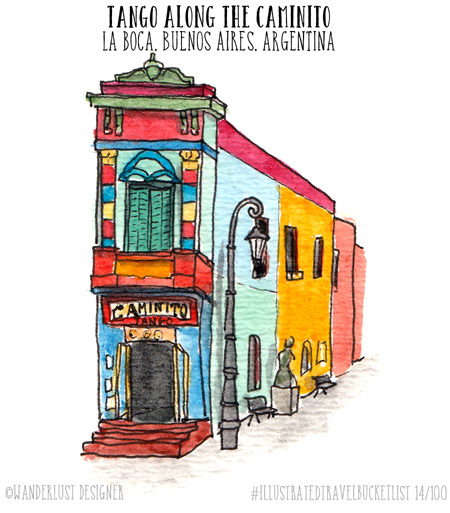 At less than 100 meters long, the Caminito, or “Little Way” is one of the most colorful spots in Buenos Aires. Although it is often thronged with tourists, it is an area with a lot of history and well worth a visit. In the late 1800’s and early 1900’s over 6 million immigrants flooded into Buenos Aires turning the small town into a big city. Almost half of those immigrants were Italians. Many from Genoa (a port town in Italy) saw the area of La Boca (translated as the mouth and also a port area) as familiar and settled in. The area went though many hard times, where at one point, the Caminito (a dried up stream that fed the Riachuelo River) was a neighborhood eyesore. Along came artist Benito Quinquela Martin in the late 1950’s and early 60’s who took it upon himself to lively this little area up with pastel colors and installing a stage. He wanted to bring back the flavor of the old immigrant area of La Boca, where Tango flourished. Although some criticize that the area is not original, it is truly authentic. If you have ever seen the movie, Gladiator you are well aware of some of the brutal history this iconic Roman site has endured. The Colosseum of Rome was commissioned around 70-72A.D by Emperor Vespasian as a gift to the Roman people. In 80 A.D., Vespasian’s son Titus officially opened “Flavian Amphitheater” (as it was called) with a 100 days of games including these famous gladiator battles and wild animal fights. With over 5oo years of use, the colosseum began to fall into neglect. Only looting and random inhabitants (like locals using it as an animal stable) used the site until around the 1800’s when finally Papal authorities recognized the value in restoring the site. Now it is one of the top sites to visit when in Rome and well worth it. 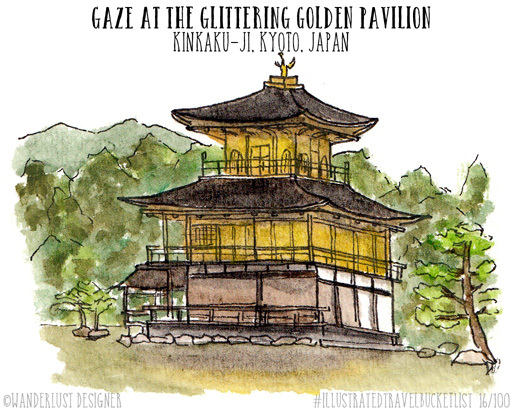 This incredible gold-leaf coated, Zen Buddhist temple is one of the most popular buildings in all of Japan and a symbol of Kyoto. Kinkaku-ji was built at the end of the 14c as a villa for the shogun Ashikaga Yoshimitsu. After his death, his will indicated he wanted the site to be converted to a temple. Since then, Kinkaku-ji has burnt down several times, most recently by one of the temple’s monks in 1950. In 1955, the newly restored gold-leaf temple was reopened and to this day sparkles along side of the mirror pond called, kyoko-chi. The grounds have been laid out such that there are spectacular vantage points to the temple at many different angles. Even with the large number of tourist, the temple can be observed with unobstructed views year round, covered in snow in the winter, or surrounded by lush greenery in the summer. Visitors are never disappointed. Located in Guanajuato state, about 165 miles from Mexico City, San Miguel de Allende has long been a haven for artists and expats who want to experience the charm of a historic Mexican town. Although now it is much larger than just a town, it still retains its alluring qualities with cobblestone streets, colonial architecture, regular festivals and stunning surroundings. And even though the secret is out, and many tourists flock to San Miguel de Allende, it’s lack of an international airport close by and relatively large distance (for a day trip) from Mexico City keeps the streets from feeling mobbed or overrun. 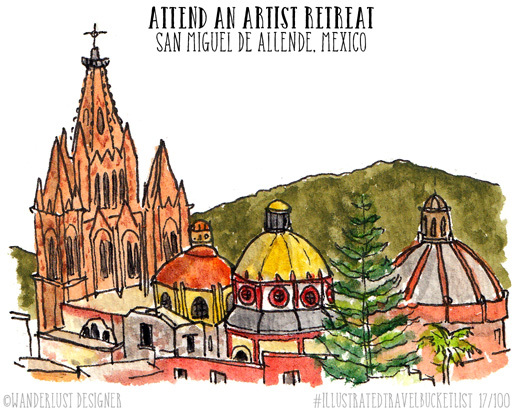 San Miguel de Allende is still a true gem nestled in the hilly highlands of Mexico. Not much needs to be said for this bucket list item! A kiss on top of the Eiffel Tower in Paris will always be remembered. This iconic symbol for Paris is mobbed with tourists every year, yet even with the crowds, there is still charm and beauty to it’s elegant, wrought iron structure. 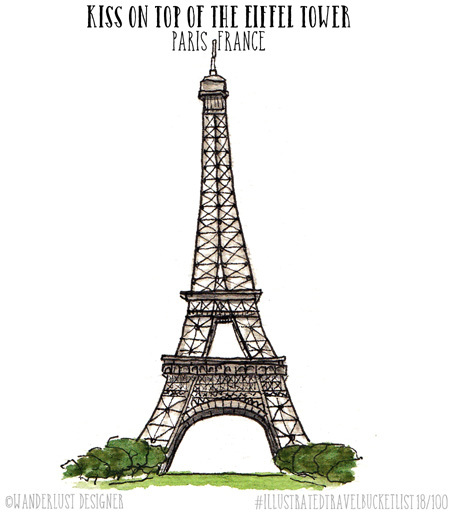 Pack a picnic and dine on the lawn gazing up at the tower and once through, take the lift of hike up the stairs to get the best view of the City of Light and that memorable kiss! 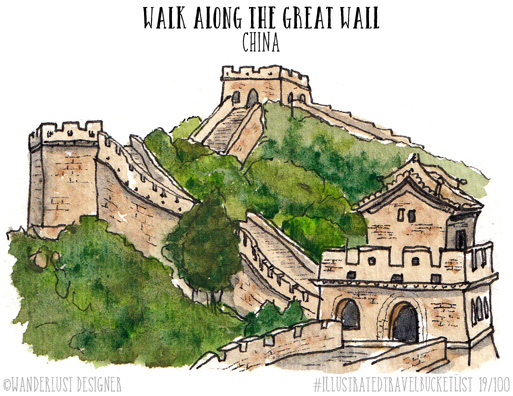 Spanning almost 13,170 miles from East to West across China is the famous Great Wall. The wall is not one continuous structure, but many different spans of structures. Some parts of the wall are said to have been built as early as the 7th century B.C. with another large construction effort by Emperor Qin Shi Huang in the 3c B.C. to prevent invasions by nomads. But, the most famous building efforts of the wall were during the Ming Dynasty (1368–1644). Some sections are now in ruins, but an amazing amount is still intact. The wall not only is an architectural feat but also shows the strength and power of China’s enduring history. Chosen as one of the “New Natural Seven Wonders of the World,” the powerful force of Iguaçu Falls that divides the countries of Brazil and Argentina is a site for all nature lovers to witness in person. The falls is actually made up of over 270 smaller “falls” as the Igauçu river heads to meet up with the Paraná river at the borders of Brazil, Argentina and Paraguay. At the heart of the falls is the ominous Devil’s Throat, a narrow v-shaped slit in the rock formation where torrential water falls into what looks like a hole, and then floats down the river. The Argentinian side allows for meandering trails in and out of the falls along the cliffs edge, while the Brazilian side provides grand views of the heart of the falls. 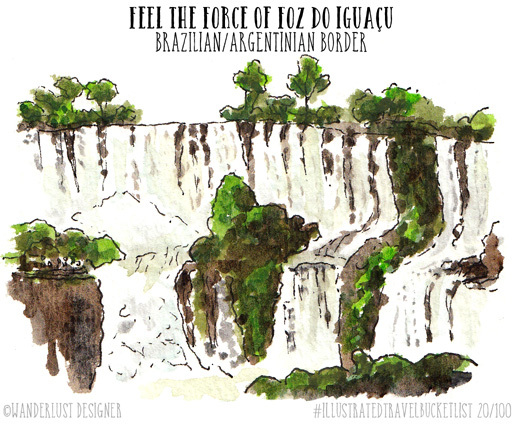 With so much nature to see and experience here, an adventure to Foz do Igauçu is well worth the trek.